Fireworks (打ち上げ花火、下から見るか? 横から見るか?/Fireworks, Should We See It from the Side or the Bottom?) is an interestingly frustrating film that could’ve been great. With an intriguing story hidden somewhere deep in the film and its perceived premise, Fireworks unfortunately fails to connect the dots that would have made it a creative success. SPOILER ALERT! Detailed spoilers begin now! 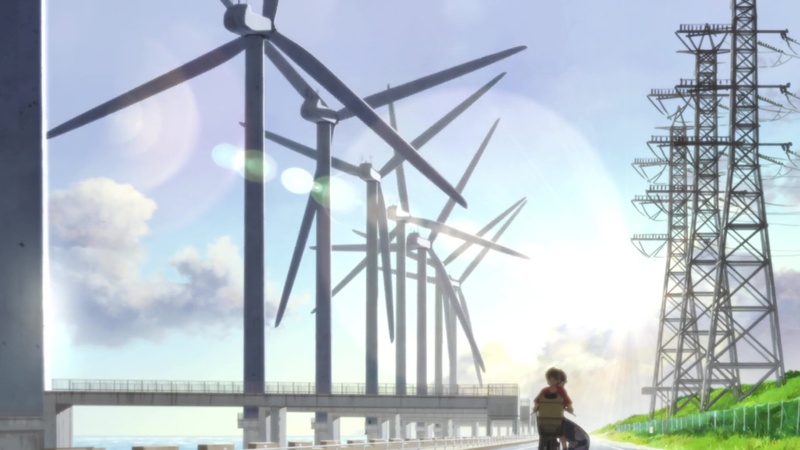 Based on a 1993 TV movie, the film focuses mostly on high schoolers Norimichi and Nazuna who live in the rural seaside town of Moshimo which somehow turns into an increasingly fantastical and surreal place every time Norimichi rewinds time after he hurls a glass marble-like object Nazuna had found by the sea that morning. That’s really the simplest way to describe the basic plot without doing a full and detailed summary of the film. And I will assume if you’re here, you probably already have seen the film. So let’s move on to what seems to have gone wrong lest we dissect every frame to try and find what this could all possibly mean. 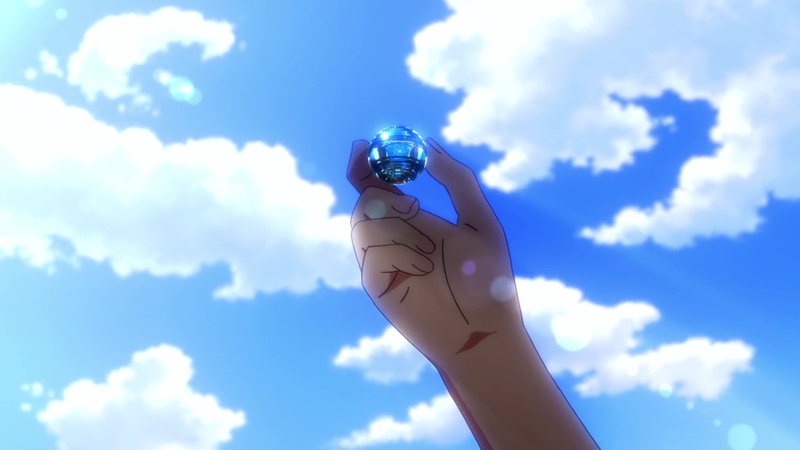 Norimichi discovers that the little glass marble thing Nazuna finds by the sea turns back the clock to whatever moment he wishes and whatever specific action or result he wishes to happen at that moment. And this is accomplished by him hurling that marble into the air, at something, letting it fall. Who knows. This happens two more times before the end of the film and each rewind is distinct by how the fireworks look. In the first rewind, the fireworks are oddly flat, seemingly settling the debate Norimichi and his friends were having. The second rewind has the fireworks look like strange flowery explosions. And of course the final rewind has the fireworks accompanied by the marble growing to an enormous size and then shattering while the town becomes distorted and encapsulated in some kind of dome. Thinking about all that’s happened in the film, I can get the idea that the story is all about one’s destiny or fate. Either our choices decide our future. Or our future has already been decided regardless of what choices we make. That’s all well and good. But you don’t actually get that sense from the film unless you’re reaching for some kind of understanding or explanation. Too much exposition in a story isn’t really the best thing since you want to be able to figure things out on your own without being told. For this film, however, it needed some exposition. Actually, a lot. And even as the film is now, even just a few minutes of exposition would have made everything much better. The film lacks cohesion and a connection. Cohesion in the sense that all the fantastical elements and the rewinding (not really time traveling in the traditional sense) convulute whatever the narrative aims for. You never have to get the exact and detailed explanation for why things happen especially things that are fantasy or science-fiction in theme. But here when everything else doesn’t seem to come together, the ideas behind or the catalyst to the more fantastical elements needed to be fleshed out some more. And there’s a lack of connection because there’s really no reason for you to care about our two main characters and their actions. We don’t really know exactly why Nazuna is cold to her mother and her future stepfather #2. 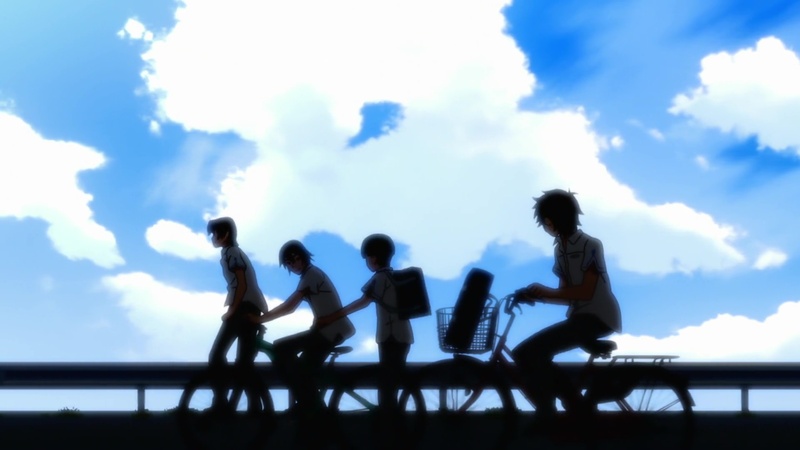 And we don’t even get the sense that Norimichi has any feelings for Nazuna other than him staring at her while he’s on his bike at the beginning of the film. So we’re supposed to automatically root for them to end up together? The lack of understanding and connection with these characters is probably what hinders the film the most. With these kinds of stories, you want to be able to immediately connect with the characters. Because regardless of how crazy the story might get, you will still always be able to connect with the characters in a way that makes you care about what happens to them in the end. At the end of the film, we are left with an open-ended ending. Where’s Norimichi? The teacher calls his name during the roll call, yet no one answers. If we take everything that’s happened in the film literally, he’s not in class because he’s run away with Nazuna as they planned. Or, as the future showed in the shard he grabbed. If we want to get darker and more morbid, both Nazuna and Norimichi died when they drowned in the water. Either they drowned when Norimichi tries to save Nazuna after she falls in. Or they drown after they made out too long underwater. (Because, romantic!) They also could’ve decided to commit suicide. And they even could’ve died the first time they fell from the lighthouse after Yusuke lunges at them. 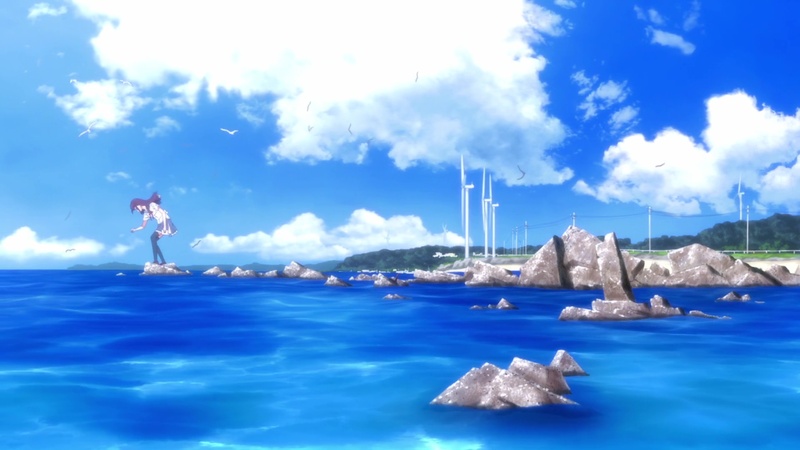 The very first scenes of Nazuna and Norimichi in the water (though in their swimsuits, not their clothes at the end of the film) heavily imply they get sucked into the dark depths of the ocean as they wonder what world they will end up in next. But these conclusions rest on the idea that the magic marble actually allowed time to rewind and allowed Norimichi (and a little bit Nazuna) to wish for different, specific outcomes. It’s important to note that the marble does more than simple time travel. It gives you the situation you want for the moment it takes you back to. And then you’re free to make your choices accordingly after. Now what’s interesting about every do-over is that all the other characters are also very much involved. That is, they also experience the increasingly surreal surroundings as the story went on. From the odd fireworks to the dome. But none of them seemed at all surprised or taken aback from their strange new surroundings. Norimichi himself barely acknowledges the rewinds and the strange differences until the last act of the film. That includes the very random musical number which gets half-repeated a few minutes later. It was a good song and all that. But when by that point, we’re still trying to grasp what is going on, it was just out of place and unnecessary. It was more odd than magical. There’s no real moment of realization for Norimichi. And that seems to be part of the lack of true character development for him or anyone else in the story. This is more supported by what might be the only exposition in the entire film, the “if” in the coils of the marble or whatever it was that would light up. Norimichi may not have actually been rewinding time. But the marble was presenting him different scenarios and possibilities depending on different choices or actions he might decide to take. All the “What ifs” that are swimming around in his head playing out for him. So that when he eventually wakes up, he can make the choice(s) he feels is/are right for him and what he might want. Of course, Nazuna and Yusuke also see some possible futures that they might want as well. The marble is actually a crystal ball? I have no idea how. Just like how we have no idea how the drunk festival worker/fireworks guy made the small marble turn into a big fireworks ball/shell that he could shoot up into the air in the first place. Let alone the thing enlarging and exploding into glass shards that absolutely didn’t hurt anyone in town. We assume. Many times, it is easy to suspend one’s disbelief when the story and/or the characters engage you. The connection is made early on or everything just clicks and comes together in the end. Ultimately, Fireworks is unable to do either, even with a suspension of disbelief twice over. There’s definitely a really great and epic story in this premise. Even if! we don’t really know conclusively what the premise truly is by the end of the film. All about choices and fate? Or a tragic end to a one day romance? I guess the open ending leaves it up to you. And I’ve loved many an open ending before. But for this film? I’d prefer it have spelled it all out.